This guide will teach you everything you need to know about the best skiing in South America. how to get there, cool tips on the best South America ski resorts, guided tours and much more. 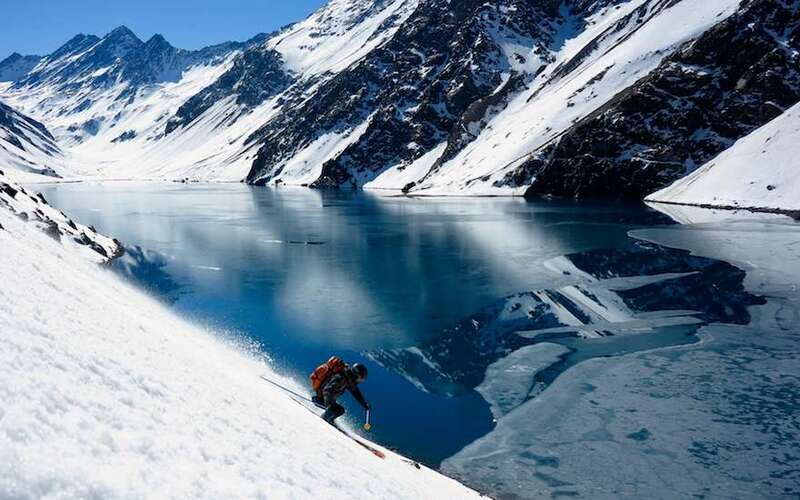 Let’s drop right in, the Andes ski season starts in June! Snowboarding and skiing the Andes Mountains during the Northern Hemisphere summer is one of the world’s most awe-inspiring experiences and a must-do on any powder hounds bucket list. As the longest mountain range (4,300 miles) with the second-highest peaks on the planet, the Andes provide not only an adventure of a lifetime, but reverse seasons that allow northerners to escape the hot days of summer and keep the “Endless Winter” alive. In both Chile and Argentina, South America’s ski resort destinations (detailed in Chapter 3) vary from local, seat-of-the-pants operations to internationally renowned, world-class resorts with high-end accommodation and a modern lift infrastructure. A laid-back ambiance means that on most days there are hardly any lift lines or many people on the slopes. If you’d like to push the adventure further, there exists a seemingly endless amount of backcountry opportunities. Off the slopes, destination resorts and local villages in both Chile and Argentina offer fabulous dining paired with wine that both countries are famous for, and a lively nightlife scene that can last well until the break of dawn. Pair your summer ski trip with a visit to Buenos Aires or Santiago, a wine-tasting trip, or any other of the easily accessed pre or post tours, and you have the makings of one spectacular vacation. Chile and Argentina are very family friendly and with school vacations in the northern hemisphere, a South America ski trip could very well be the best family vacation you’ll ever have. Skiing in South America is like skiing on another planet, accented by delicious food and aprés. Shake up your perspective on “summer vacation” and escape to winter this July to September. The South America ski season is June to October, but can on occasion begin as early as mid-May. The two middle weeks of July are South American school holidays and should be avoided due to increased lift lines and higher prices. Weather and snow conditions are unpredictable in the Andes, more so than at ski destinations in the US, and climate can vary considerably depending on the month and where you are traveling. The quality of snow in South America sits somewhere between the kind of Pacific coastal snow seen in resorts like Whistler, and dry powder snow seen at resorts in Utah and Japan. Andean storms are typically big and leave a lot of fresh snow followed by bluebird skies. They cycle through periodically as opposed to continually, but with so few people on the mountain, powder days can last longer than you’d see at a US-based resort. Mid to late June can surprise with a big dump and truly outstanding conditions, but on average the best time to ski South America is late July, all of August, and the first two weeks of September, but even in early September temperatures are heating up and a mix of winter and corn snow (melt-freeze snow, only 2nd best to powder!) is the norm. For backcountry skiing, late July onward gives the Andes enough time to accumulate snow, and backcountry touring options can last well into mid-late October. Ski resorts in South America operate during the Southern Hemisphere winter and spring months June to October. Travelers can expect large, high-quality, internationally renowned resorts such as Ski Portillo and Valle Nevado in Chile, and Las Leñas and Catedral Alta Patagonia in Argentina. Cerro Catedral is the largest ski resort in South America. Other smaller, off-the-radar getaways are Cerro Bayo, Pucón, and Corralco, nestled in Jurassic-like forest with jaw-dropping landscapes and zero crowds (except a two-week period in mid-July during school holidays). With two decades of travel experience on the continent, we at PowderQuest have compiled extensive user guides with travel tips and resort reviews to our favorite destinations in both Chile and Argentina. Dig deeper into exploring the beautiful Andes by clicking on the resort links below. Tip: Snowboarders should not miss our exclusive South America Snowboarding Destination Guide. After 20 + years exploring 25 South American ski resort, we continue to find the answer difficult. Why? Because each resort has its own unique charm and most travelers arrive with differing interests, expectations, skill levels, and time frames. Las Leñas, Argentina has the steepest terrain, and energetic nightlife. Nevados de Chillan, Chile has fun out-of-bounds freeriding with terrain naturally carved by ancient lava flows, and hot springs. One of the few Chilean destinations with tree skiing. Valle Nevado and Portillo in Chile have supremely cozy ski-in ski-out hotels, dry powder snow, and top-notch cuisine. 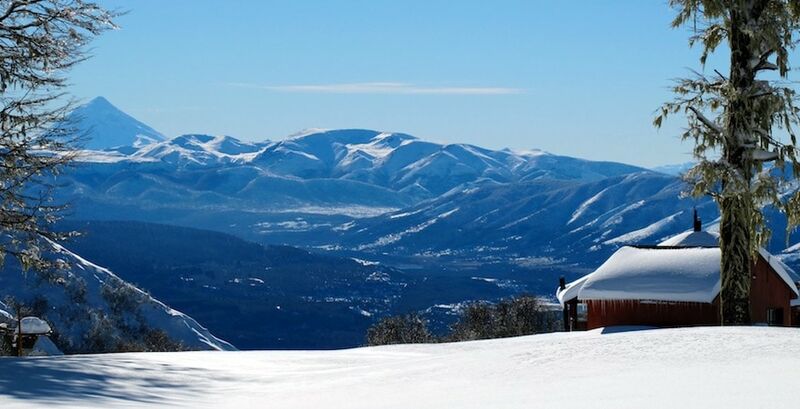 Resorts in Argentine Patagonia such as Cerro Catedral and Chapelco can’t be missed for the mix of terrain, tree skiing, culture, amazing food and nightlife. Travel Tip: The smaller destinations at the base of smoking Chilean volcanoes should not be overlooked as skiing the skirts of an active volcano is found in few places on the planet. At the end of the day you can soak in natural thermal hot springs under the canopy of an old growth forest and monkey puzzle trees. Truly Unforgettable. Another frequent question we receive is how to compare the skiing quality between Chile and Argentina. All resorts are above tree line (timberline), located at high altitudes and receive drier snow than their southern counterparts. They can on average receive less snow than Patagonia. The steepest skiing is at Las Leñas, followed by Portillo and then La Parva. Be aware it can take a very long time for the crew at Las Leñas to dig out the Marte chair after a big storm, so expect some down time with this famous chairlift. All of these Patagonian resorts can receive a lot of precipitation, but temperatures can rise occasionally and that snow can turn to rain. The good news is that storms generally finish cool, so the rain often transitions back to snow adding some fresh snow to the base. Tree skiing is bigger in Argentina, whereas in Chile trees are found in much lower levels of each resort. 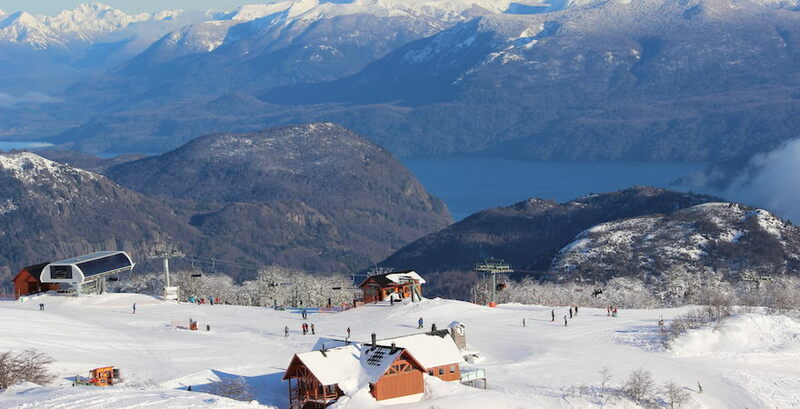 Of the listed resorts in this region, Argentina has, by far, better weather and overall better infrastructure, better terrain, and better skiing on the whole. However, our guests are still attracted to the Chilean side for the opportunity to climb and ski active volcanoes. 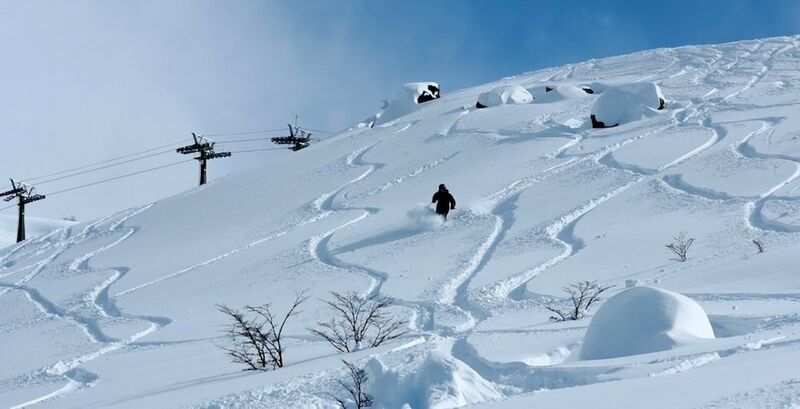 Alta Patagonia near Bariloche has invested millions of $ over the past few years and is now one of the best ski resorts in South America. La Hoya is much smaller, but has good steep skiing and is worth checking out. It is also one of the coldest areas in Argentina for skiing so the powder stays pure and the season can extend well into October. So, really, in Patagonia it’s Argentina or nothing. Wait, What about Nevados de Chillan in Chile? Chile’s stand-alone ski destination Nevados de Chillan sits between the Central Valley and the Lake District, combining the best of both regions: good snowfall and drier conditions, and a good mix of alpine skiing and trees, with a massive volcano that can be explored for days with one of our qualified guides on select guided trips. Get in touch for more info. Here are 2 key differences when comparing the Andes ski resorts to those in the Northern Hemisphere. Overall expect later starts than you are used to at most resorts in the Northern Hemisphere. The 7:00am rush to get to the tram line-up simply does not exist in the Andes. Most ski resorts open by 9:00am but full mountain operations can be delayed until mid-morning for no apparent reason. When there is fresh snow or a current storm, these delays can be even longer. However, due to longer natural light, you can also ski later into the afternoon in South America. Some resorts do not stop running lifts until as late at 5:30pm. If you are accustomed to North American ski resort amenities, you will find the infrastructure of some resorts more rustic, especially the speed and layout of the ski lifts. Groomed runs are not what you find in Colorado, and mountain hazards and boundaries are not marked as vigorously. But Does All This Really Matter? It’s a matter of perspective. Simply put South America simply runs on a different pace. The good news is, we find it all evens out. 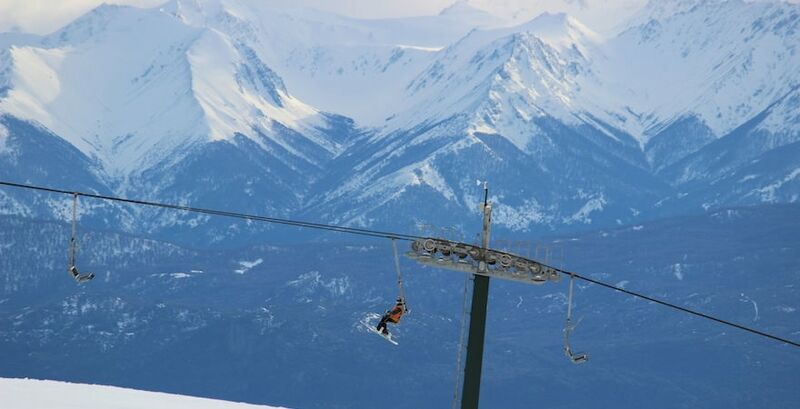 Some lifts may be slower, however 45 minute lift lines are virtually non-existent in the Andes (one exception: Bariloche’s Cerro Catedral on busy weekends). In addition, you do not have thousands of skiers fighting for those untracked powder runs. If you come with an open mind you will find this part of the world fascinating and quite often comfortably relaxing. And hey, you are skiing in August! It may seem like an epic journey but really, getting to ski destinations in South America is much easier than you think. There are copious overnight flights to Santiago, Chile, (SCL) and Buenos Aires, Argentina (EZE) from North America, Europe and Australia, most of them nonstop direct from major hubs. American, United, Delta, Latam and Aerolineas Argentinas airlines offer nonstop service from Miami, New York, Dallas, Atlanta, Los Angeles, and Houston. Direct flights from Los Angeles are available to Argentina on American Airlines, but many of their LAX to Santiago flights have a stopover in Lima, Peru, so be sure to check when booking. Check out Hopper for flight deals. Direct flights to Santiago and Buenos Aires are available only with Air Canada from Toronto. Flights from Calgary, Vancouver and other major Canadian cites route through Toronto or a hub in the US (better to fly out of Toronto and avoid the extra step of going through customs in the US). Direct flights to Santiago from Melbourne and Sydney are now available with Qantas. Flights to Buenos Aires from Australia are trickier, with one to two stopovers and a long travel time. 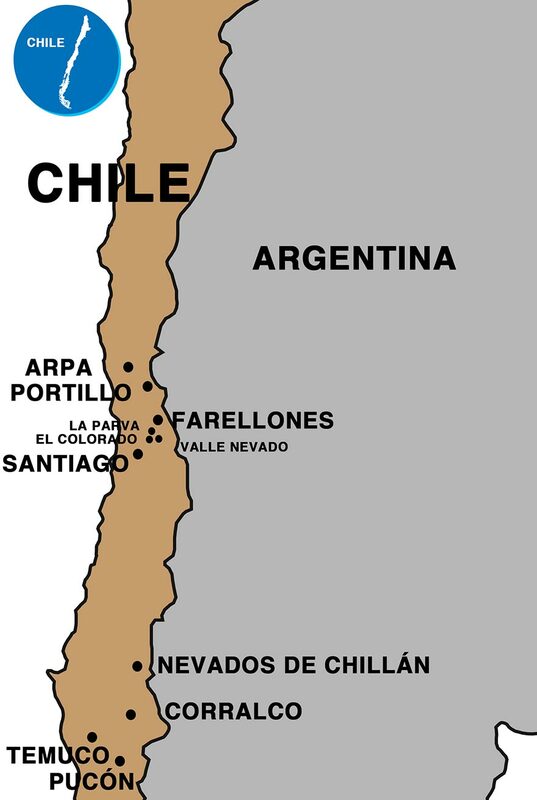 If you do not need to fly to Buenos Aires, one hack is to fly to Santiago, Chile followed by a short 55min flight over the Andes to Mendoza, Argentina. From here make your journey to Las Lenas. Air France, Alitalia, Latam, Iberia, British Airways, and Norwegian airlines offer direct flights from Madrid, Rome, London and Paris. The location of Santiago is similar to flying into Denver, CO, or Salt Lake City, UT, with close proximity to ski resorts, usually within a 90-minute to two-hour drive. In fact, overnight flights with early arrival times mean you can be skiing at Valle Nevado, La Parva, El Colorado and Portillo ski areas by lunchtime once you arrive! Ski Arpa adventure-based cat skiing is also nearby and should not be missed by advanced powder hounds looking for a true Andean remote experience. The Chilean resorts further south can be reached quite easily via a short domestic flight or ground transportation such as a train, sleeper bus, private transfer, or rental car. See each resort page for details on how to arrive. 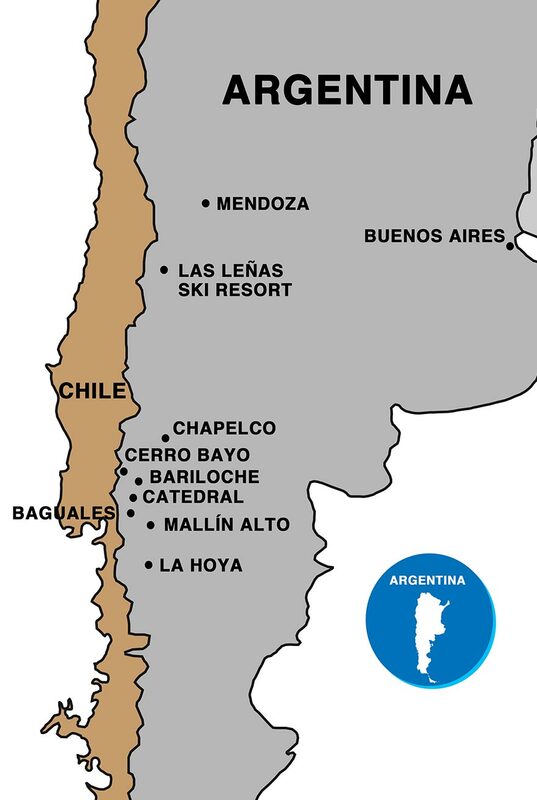 Unlike Santiago, there are no ski resorts close to Buenos Aires which necessitates connecting with a domestic flight to reach the Andes region. Some flights out of Buenos Aires require you to switch airports so be sure to allow time for these connections. Getting from airport to airport in the city is quite simple with options ranging from private transfers with English-speaking drivers to pubic bus shuttles and of course the traditional taxi services (known as a remis). If you speak spanish, check out Tienda Leon for various transfer options bookable online. Malargue (airport code LGS) to get to Las Lenas via charter flights. Ushuaia (airport code USH) to get to Cerro Castor, the southernmost ski area in the world. More details to arrive to each ski area are in our detailed resort destination guides. Ski resorts? No gracias. Cat-skiing, heli-skiing, and human-powered backcountry ski touring and splitboarding excursions are great options getting you to some of the best backcountry skiing in South America, if not on Earth. 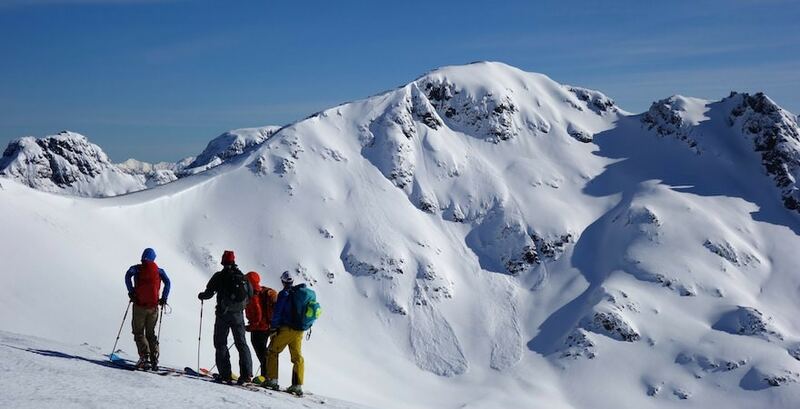 Ski tour remote, majestic peaks and glaciers and around smoking volcanoes. If mechanized adventures are more your style, South America hosts cat ski-assisted journeys, sledding and heli-ski trips that can feed your skiing soul with up to 5,000 feet of vertical descent in one run. South America’s backcountry is massive. Easy access from most ski areas in Chile and Argentina open up a world of adventure for skiers and riders with skins and a sense of adventure. Need a ski guide? Check out these highly rated guided trip ideas. PowderQuest offers 2 decades of experience building custom South America ski resort vacation packages and honeymoons. Get started below. Imagine a multifaceted travel experience skiing several of South America’s best resorts or backcountry zones while delving into local culture. Welcome to PowderQuest guided South America ski and snowboard tours since 1999. Trip options built to accommodate your ability level and how you like to spend your days in the mountains. Come explore with us!